Prostate cancer is the second leading cause of cancer-related deaths among men in the United States. It is estimated that in 2010, approximately 32,000 American men died of prostate cancer and 218,000 were newly diagnosed with the disease. Most prostate cancers are detected by a blood test that measures prostate-specific antigen (PSA), a tumor marker. More than half of cancers detected with PSA screening are localized (confined to the prostate), not aggressive at diagnosis, and unlikely to become life-threatening. However, 90 percent of patients receive immediate treatment for prostate cancer, such as surgery or radiation therapy. In many patients, these treatments have substantial short- and long-term side effects without any clinical benefit. Appropriate management of screen-detected, early-stage, low-risk prostate cancer is an important public health issue given the number of men affected and the risk for adverse outcomes, such as diminished sexual function and loss of urinary control. Tools that can reliably predict which tumors are likely to progress and which are unlikely to cause problems are not available at present. Currently, clinicians rely on two observational strategies as alternatives to immediate treatment of early-stage prostate cancer: watchful waiting and active surveillance. Watchful waiting involves relatively passive patient follow-up, with palliative interventions if and when any symptoms develop. Active surveillance typically involves proactive patient follow-up in which PSA levels are closely monitored, prostate biopsies may be repeated, and eventual treatment is anticipated. Yet, it is unclear which men will most benefit from each approach and whether observational strategies will yield outcomes similar to immediate treatment when managing low-risk prostate cancer. How have the patient population and the natural history of prostate cancer diagnosed in the United States changed in the last 30 years? How are active surveillance and other observational strategies defined? What factors affect the offer of, acceptance of, and adherence to active surveillance? What are the patient-experienced comparative short- and long-term health outcomes of active surveillance versus immediate treatment with curative intent for localized prostate cancer? 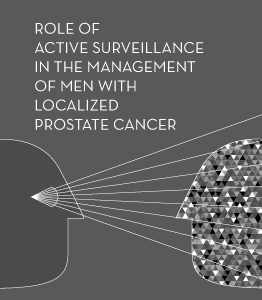 What are the research needs regarding active surveillance (or watchful waiting) in localized prostate cancer? A multidisciplinary planning committee developed the questions, which will be addressed in an evidence report prepared through the Agency for Healthcare Research and Quality's Evidence-based Practice Centers program. During the conference, invited experts, including the authors of the report, will present scientific evidence. Attendees will have opportunities to ask questions and provide comments during open discussion periods. After weighing the evidence, an unbiased, independent panel will prepare and present a statement addressing the key questions. The statement will be widely disseminated to practitioners, policymakers, patients, researchers, the general public, and the media. I. How have the patient population and the natural history of prostate cancer diagnosed in the United States changed in the last 30 years? II. How are active surveillance and other observational strategies defined? 1:30 p.m. What Is the Risk Posed by Prostate Cancer? III. What factors affect the offer of, acceptance of, and adherence to active surveillance? Richard M. Hoffman, M.D., M.P.H. Peter R. Carroll, M.D., M.P.H. IV. What are the patient-experienced comparative short- and long-term health outcomes of active surveillance versus immediate treatment with curative intent for localized prostate cancer? Mark S. Litwin, M.D., M.P.H.